This Information Sheet provides information on Topic 2: Climate Change Modelling. In the Introduction to this module you would have been provided with an overview of the content of the training programme and why climate change is a critical area of consideration for project implementation. This topic focuses on a more detailed introduction on how climate change models work and the modelling that has been done for Mohale’s Hoek. Climate change modelling is the process of developing complex equations to predict the way in which atmospheric and ocean conditions will change in the future. The models include information on physics, fluid motion, and chemistry, and then use the equations to work out changes in wind, heat transfer, radiation and relative humidity. Global climate models (GCM) or general circulation models divide the earth into cells or three dimensional grids. The cells are modelled using information from neighbouring cells to create overall trends. The smaller the cell, the higher the resolution of the model and the more detail present and the more computing power required. The IPCC publishes regular Assessment Reports and these reports have increasing levels of resolution in the modelling that is used. The image below shows how the resolution of the climate change models have improved from the First Assessment Report (FAR), where cells of about 500 km were used, through the Second (SAR), third (TAR) and fourth assessment report (AR4). In the AR4, the grid cells were approximately 110 km wide. Let’s first look at percentiles. A range of mathematical models have been developed by climate scientists to try and accommodate the complexity of climate science. These models show slightly different results depending on the assumptions and calculations used in the models. So to get an overall picture, climate science looks at a range of these models. The results of these modelling exercises are then grouped into ranges called percentiles. For example, if you are looking at the potential increase in temperature in a particular area, and half of the model prediction results lie above a 2 degrees increase, and half are below a 2 degrees increase, then the 2 degrees increase is called the median or 50th percentile. The data that lies above the 90th percentile or below the 10th percentile are usually regarded as outliers and are ignored. For basic modelling purposes, the median is usually the simplest guide, with the range between the 90th and 10th percentiles indicative of the agreement, or lack of agreement, between the various models. Another key climate modelling concept is the concept of Representative Concentration Pathways or RCPs. RCPs are future scenarios or pathways for the world in terms of climate change. Scientists have developed four RCPs depending on the global community’s effectiveness at reducing greenhouse gases. The four scenarios are grouped according to the amount of carbon dioxide equivalent (CO2 eq.) that is predicted to be in the atmosphere by 2100, measured in parts per million or ppm. Bear in mind that the global concentration of CO2 eq. was less than 300ppm before the industrial revolution, and we have recently passed the 400 ppm mark. The graphs below show emissions of the main greenhouse gases across the different RCPs. RCP8.5, which is the least optimistic pathway and predicts a future with more than 1370 ppm CO2 eq. by year 2100. This pathway is shown in blue on the graphs. RCP6, which will result in 850 ppm CO2 eq. by year 2100. This pathway is shown in black on the graphs. RCP4.5, which will result in 650 ppm CO2 eq. by year 2100. This pathway is shown in red on the graphs. RCP2.6, the most optimistic pathway, which will result in 490 ppm CO2 eq. before year 2100 and then decline by year 2100. This pathway is shown in green on the graphs. It is obvious that the more CO2 eq. in the atmosphere, the more severe the impacts of climate change will be. The Intergovernmental Panel on Climate Change (IPCC) collates results from key global climate models when compiling their annual Assessment Reports. This collection of models are called the Climate Model Intercomparison Project (CMIP). CMIP3 is the model collection used in the IPCC’s Fourth Assessment Report (AR4) in 2010, and CMIP5 is the model collection from Fifth Assessment Report (AR5) from 2013. There is a lot of similarity in the results from CMIP3 and CMIP5, but in general CMIP5 is used for research purposes as it contains more recent modelling information. The presentation of climate change modelling often includes information from a range of models. The bottom axis shows the months of the year. The vertical axis shows the change in total monthly rainfall. The grey lines show the projected change for each model. 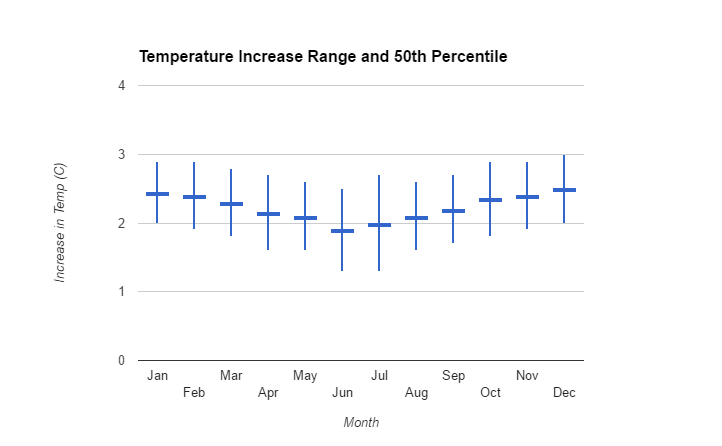 The solid bars represent the range between the middle 80% of the projected change, excluding the upper and lower 10%. The easiest way to interpret the graph is to imagine a halfway line between the top of the blue bar and the bottom of the red bar. This line would be close to your 50th percentile. Looking at this graph, in January the line would start at around 16mm while in February it would be closer to 12 mm. In March, the 50th percentile line would drop to around -5 mm, and so on across the different months. You will also note that the graph is for “Total Monthly Rainfall RCP8.5”. You will remember that RCP8.5 was the least optimistic future scenario with more than 1370 ppm CO2 eq. by 2100. Another variable you can review is increase in temperature. The graph below presents the average maximum temperatures above current data for the time period 2040 – 2060. This graph shows that with particularly severe climate change, during the 2040 – 2060 period, Mohale’s Hoek will see increases in maximum temperatures across all seasons in the range of 1.5 – 3.5 degrees celsius. A third graph (below) shows how in a RCP 8.5 climate future, there will be a significant increase in the number of days above 32 degrees celsius. The graph shows how models are predicting that there will be between 5 – 8 additional hot days over the spring and summer months in Mohale’s Hoek. 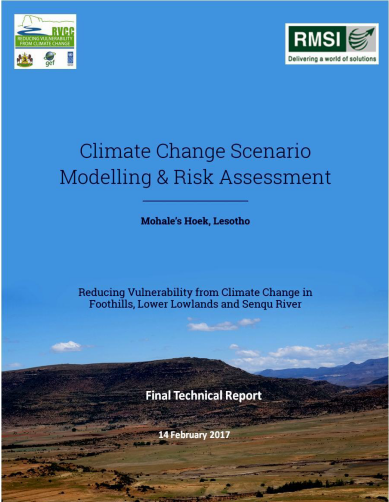 There is already downscaled climate change modelling in place for Mohale’s Hoek, available through the Climate Change scenario modelling and risk assessment – Mohale’s Hoek Report (RMSI, 2017). Changes in Surface Air Temperature: Annually, projected warming over the district is around 5.19°C by the 2080s. Change in Diurnal Temperature Range: The increases in day-time maximum air temperatures are predicted to be higher than the increases in night-time minimum surface air temperatures. Changes in Precipitation: Decline in annual rainfall by 4% of the baseline value (1961-1990) by 2080’s. Change in Number of Hot Days: Up to 160 days could experience increases in hotter day time temperatures by the end of the century. Change in Number of Warmer Nights: Up to 150 days could experience increases in night-time temperatures by the end of the century. Change in Heat Wave Spells: The frequency of heat waves, that last for a period of 6 days or longer, is projected to increase by 4-5 by the end of the century. Change in Number of Frost days- The total number of annual frost days is expected to decrease by approximately 20 days by the end of the century. Changes in Longest Consecutive Dry Days: The gap between dry spells could increase by 24 days by the end of the century which could result in severe drought in some parts of the District. Change in Number of Annual Count of Wet Days / Very Wet Days: The total annual number of wet days is expected to decrease by approximately 7 days by the end of the century. Change in Peak Precipitation Intensity: Mohale’s Hoek could experience a 54% change in maximum precipitation intensity by the end of the century. Climate Model Intercomparison Project A collation of results from key global climate models that is used by the Intergovernmental Panel on Climate Change (IPCC) when compiling their annual Assessment Reports. General Circulation Models General circulation models (GCM), also known as Global climate models (GCM) divide the earth into cells or three dimensional grids that provide overall trends for changes in climate. Intergovernmental Panel on Climate Change An international scientific body, set up in 1988, to provide regular assessments of climate change impacts, risks and response options to policymakers. Median The middle value in a list. Representative Concentration Pathways Future scenarios or pathways for the world in terms of climate change.